ThinkFun has always specialized in games that educate as you play, from the optics and angles of Laser Maze and the chain problem-solving of Gravity Maze to its Brain Fitness line of puzzles-for-one. 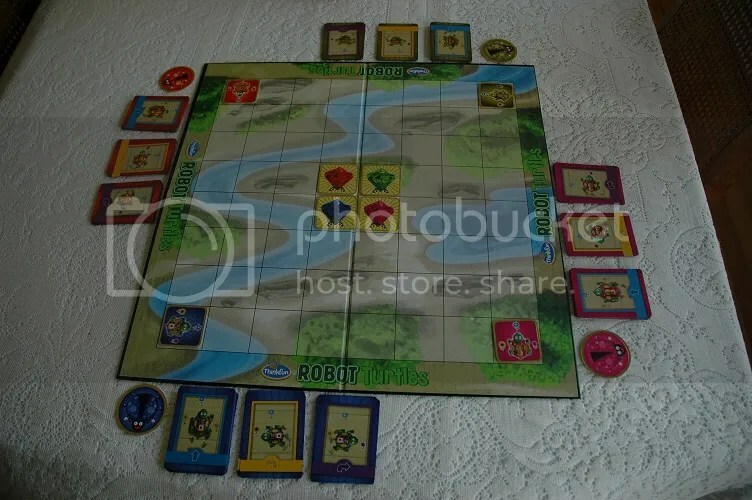 Robot Turtles is their newest game, designed for players age 4 and up, and the premise of the game is quite intriguing: it’s a board game designed to teach young minds rudimentary programming skills. Robot Turtles is a game where players have to navigate their turtles to their chosen gem. In order to do so, the player (or Turtle Master) plays cards that dictate the turtle’s movements. An adult or older sibling serves as the Turtle Mover, following the instructions of each Turtle Master as each card is played. 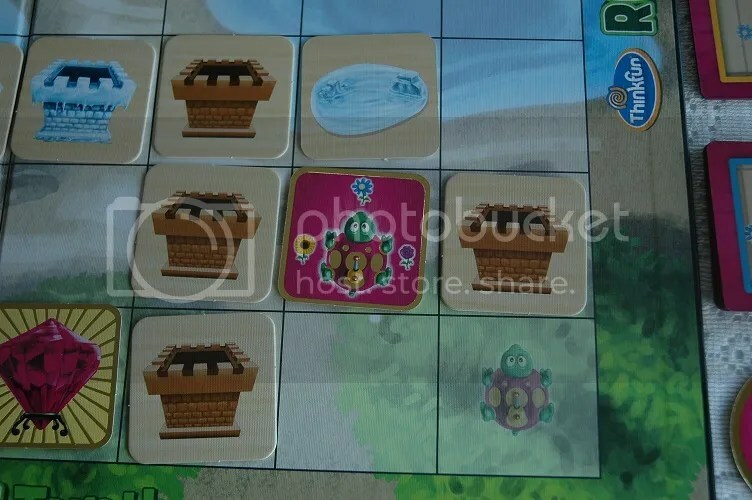 As the Turtle Masters grow more proficient at selecting their cards and directing their turtles toward the gems, the Turtle Mover sets up more difficult game boards, incorporating towers to navigate around, crates to push, and even ice towers to melt with lasers! The solutions to each game board grow more complicated, and the Turtle Masters must plan steps in advance in order to reach the gem. 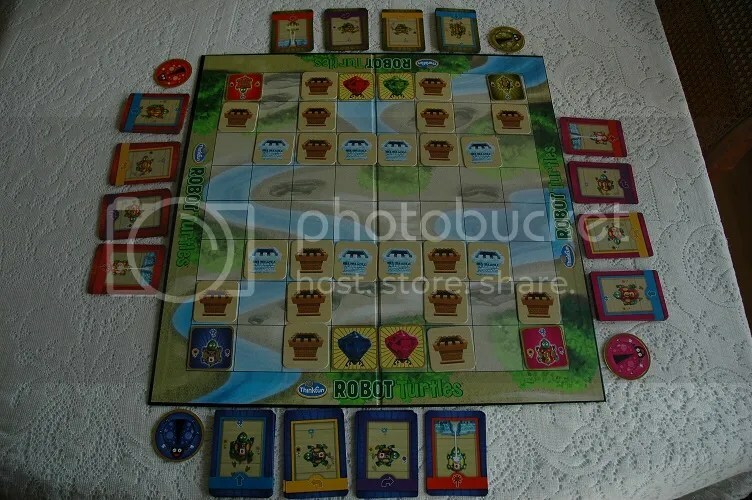 There are no losers in Robot Turtles; each player selects cards until their turtle reaches its gem. But the real genius behind the game is that the Turtle Masters are learning the basics of programming as they play. The player lays out sequences of commands (move forward, turn right, activate laser, move forward, etc. ), and then “run” the program by having the Turtle Mover execute each command. With a Turtle Mover determining the difficulty of the game board (there are a few suggestions from ThinkFun, but parents and siblings are encouraged to create new challenges for the Turtle Masters), the game has the potential for endless variations, all of which encourage players from age 4 and up to plan more detailed, more challenging “programs” for their turtles. [One of the tougher suggested layouts. 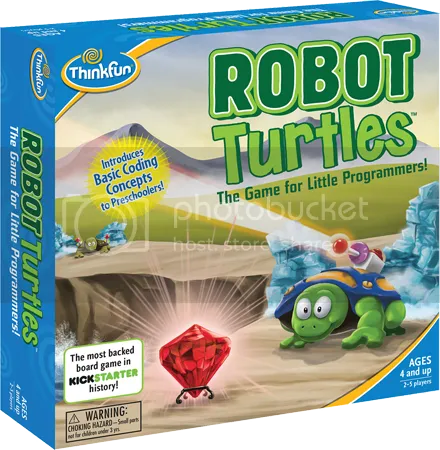 Robot Turtles is a fine addition to the ThinkFun lineup. The mechanics are simple, the educational aspect is couched in enjoyable steps, and everybody wins. Robot Turtles was the most backed board game in Kickstarter history, and in your very first game, you’ll easily see why. I can’t wait to serve as Turtle Mover again for the young programmers in my family. Last year, in one of our earliest editions of 5 Questions, author Robin Sloan said, “I really do think that, in the year 2013, people ought to know how to code, at least a little bit.” I think Robot Turtles could play a big part in making that a reality. This entry was posted in Games, PuzzleNation, Puzzles and tagged Brain fitness, coding, DIY puzzling, games, Geeking Out, Gravity Maze, Laser Maze, Pop culture, problem solving, programming, PuzzleNation, Puzzlin' fool, Robin Sloan, Robot Turtles, ThinkFun, Turtle Master, Turtle Mover by gmdirect. Bookmark the permalink.